Cape to Cape 2.0 Challenge is go! The day of departure has finally arrived. We woke early at 06:30 to enjoy our last hot breakfast for ten days, and begin our routine of packing and daily preparation on the Touareg for one last time. Many jobs all around the car to do to get all of our on-board cameras, communications and location devices powered up, fully charged, and set with fresh memory cards and so on. 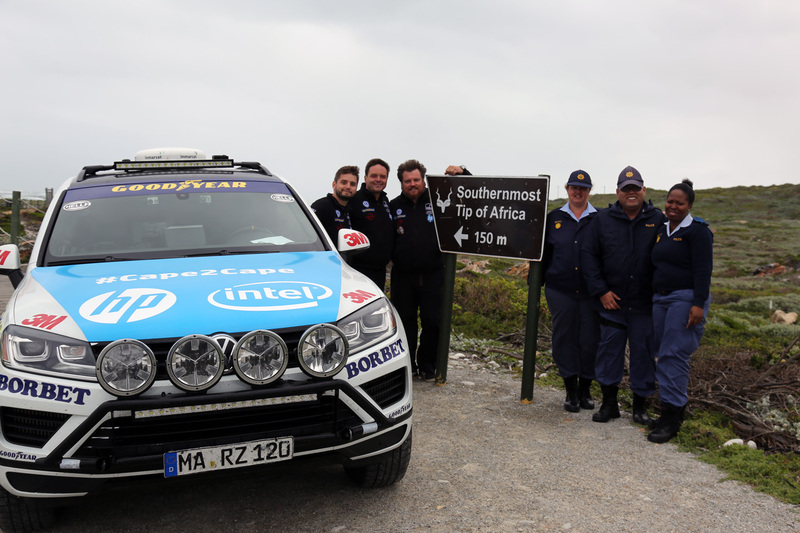 With everything ready with both car and team, and final systems checks run through one last time, we travelled the 1km from our hotel to the windswept Cape. There, as arranged, we met up with the local police chief Julia and two of her team. 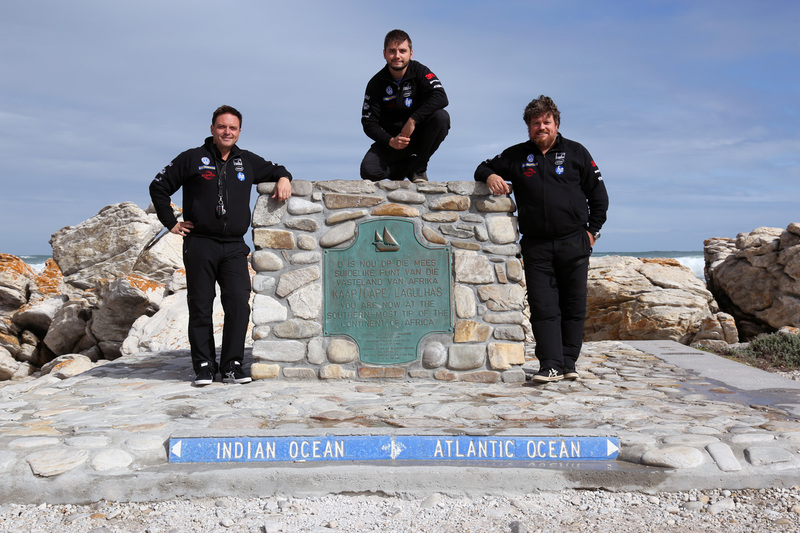 They play a vital role for us on the Challenge – to witness and certify our departure time which is an essential part of the verification of a World Record. A small group of locals and tourists also arrived to wish us well on the trip, despite the blustery weather at the Cape. As 10:00hrs came, the departure certificate was signed by Julia, and the start button pressed on our official on-board time clock. Just time for a few photos and a couple of clips of film to be taken, then with the good luck wishes from the crowd we were gone. 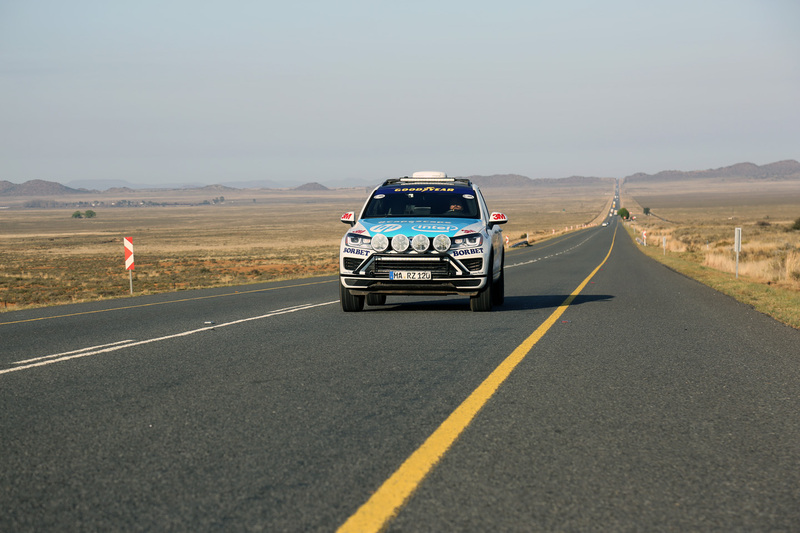 The Touareg Cape to Cape 2.0 challenge finally got underway at 10:15am. Now, we are four hours into the trip, and well making good progress. We travelled North from Cap Agulhas, on smaller, twisting roads through the edges of the South African wine region. The landscape was very mountainous in places, with the road twisting around the hills and through tunnels, with some pretty villages in between. From there we joined the larger N1 road, and the scenery has changed dramatically. We have been climbing all the time up to a desolate, never-ending high plane with a dead-straight road, light traffic and almost no other signs of life other than bright yellow and purple wild flowers next to the road. Progress is good; with the clear straight roads and no delays, we are off to a great start. 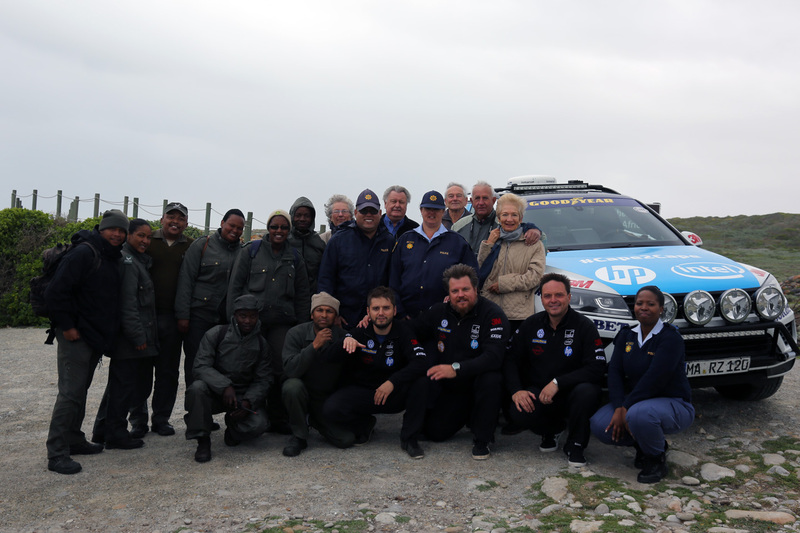 With everything ready with both car and team, and final systems checks run through one last time, we travelled the 1km from our hotel to the windswept Cape. There, as arranged, we met up with the local police chief Julia and two of her team. 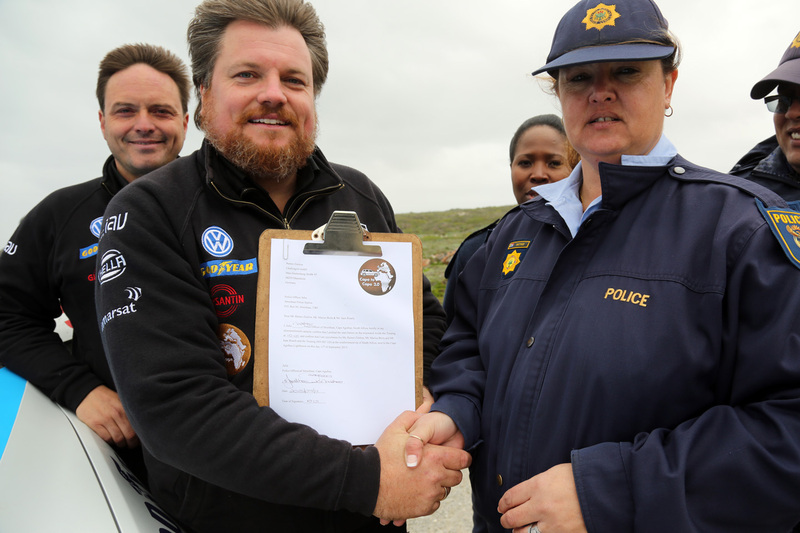 They play a vital role for us on the Challenge - to witness and certify our departure time which is an essential part of the verification of a World Record. A small group of locals and tourists also arrived to wish us well on the trip, despite the blustery weather at the Cape.